After last school year’s intensification of research productivity of the University, another research study was accepted in online and print journal publication last August 2018. 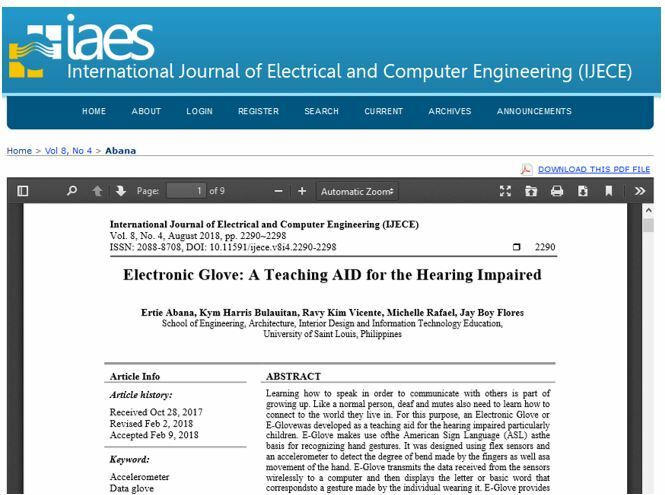 A research study of the Center for Engineering Research and Technology Innovation (CERTI), the paper titled “Electronic Glove: A Teaching Aid for the Hearing Impaired” was successfully published in the International Journal of Electrical and Computer Engineering (IJECE). CERTI’s research head Ertie C. Abana, together with his co-authors Kym Harris Bulauitan, Ravy Kim Vicente, Michelle Rafael, and Jay Boy Flores, worked on developing a teaching aid in promoting deaf education among aurally challenged learners. “The research is all about the development of an Electronic Glove (E-Glove) that can be used in the early stages of learning the American Sign Language (ASL). The E-Glove is an instructional tool that transmits data received from the sensors and displays the letter or a word in the computer through gesture recognition,” Mr. Abana explained. Mr. Abana emphasized that the said E-Glove can also be used by parents to communicate with their deaf children. The authors mentioned in their research introduction that there are three approaches in educating the deaf children, which are: the bilingual-bicultural (BiBi) approach, the auditory-verbal approach, and total communication. The teaching aid was developed using a general purpose microcontroller board for processing input coming from the combination of flex sensors and accelerometer. As discussed in the results and analysis of the paper, the wireless feature of the E-Glove will encourage healthy classroom interaction where a teacher allows his/her students to use the E-Glove in their seats and perform particular hand gestures that may serve as a form of recitation in deaf education. The authors noted that using the BiBi approach, children learn ASL as their first language. They likewise discussed that E-Glove works as an automated translator and converts sign language directly into vocal and textual format using the flex sensors and accelerometer. “Furthermore, the design of the Graphical User Interface (GUI) has an increased aesthetic appeal for children. The E-Glove can be further improved by adding more ASL sign words from the ASL dictionary to its pool of words,” the authors concluded. Moreover, the authors emphasized that the program can also be developed in a way that it can construct sentences from words detected. “We developed this [E-Glove] to make learning fun for the deaf children. We believe that through this technology, the Deaf will be fully engaged in learning different sign languages,” Mr. Abana ended. The International Journal of Electrical and Computer Engineering is a SCOPUS-indexed international journal published by the Institute of Advanced Engineering and Sciences (IAES). The journal accepts papers from experts and academic scholars in the different disciplines such as telecommunications, electronics, electrical, and computer engineering across the globe. Read the full paper at https://www.iaescore.com/journals/index.php/IJECE/article/view/9549/8866.